It was modified from a cabin cruiser to a center console fishing boat. An engine pod was also added which extended the LOA to 17' 4 ". 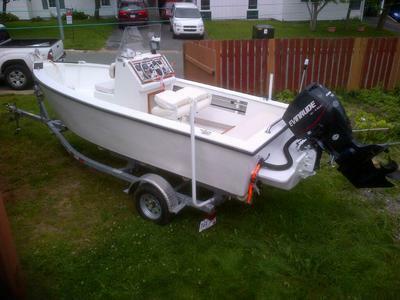 Presently it has a 75hp evenrude etec outboard. The build has taken 5 years to complete in my spare time. Constructed of fiberglass over wood. Hull frames were made of oak and sheeted in meranti plywood. The floor and decking was made from 3/4 ply and fiber glassed over. All fastening was done with epoxy resin, stainless steel and brass screws. The completed hull was later gel coated as was the floor and pod. I had not see an engine pod before. Interesting modification to add usable space inside the boat!